As a tourist in a new place, I feel compelled to run around and look at everything that is going on and the beautiful sceneries, so the museums are always left out. I am always a bit bewildered by the idea of locking myself in a place for a whole day and looking at things from the past when I should be “sightseeing.” But after some traveling, some of the most memorable things I’ve found are the notes or sketches I made at a museum. As a textile designer, I constantly look for inspiration for new motifs. 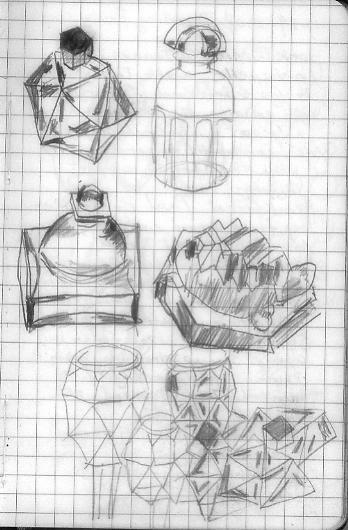 Even the most unlikely things will strike my fancy, such as these cubist looking glass jars from the Baccarat Museum in Paris or this hardware by Diego Giacometti. 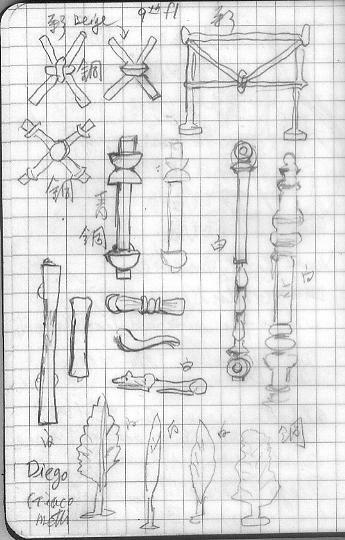 These sketches were made on 1-28-2008. You are currently viewing the archives for November, 2012 at Woven-Words.